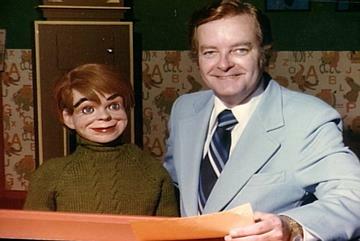 Uncle Bob and his dummy, Archie Wood, were the stars of "Archie and His Friends", a daily TV show ran in Winnipeg during the 1970's and 80's. It featured other puppets such as Tammy True, Petite the Dog, the weasely Marvin Mouse, the occasional appearance by Grampa Wood, and the frightening Robby the Robot. You're right about the crew during Robbie segments. The favourite gag was to try to grab Bob's hand in Robbie's 'teeth'. They would hold pretty tight if you caught him just right as he was trying to retrieve a dime, a script, or whatever he'd put in. The person that was operating Robbie was crouching down behind the robot and very close to where Bob would stand. Many times, his belt would get undone, his tie removed, shoeslaces tied together, etc, etc. while the camera was on the robot. Is Bob still alive? I was thinking about what show I watched as a kid and fondly thought of this one. If you see this Bob, thanks for all the happy memories. I was just thinking about this show today, my son is just 5 and I think he would have liked the songs and general silliness. I'm sorry to hear that Bob died in '89. I've been east for over 25 years and hadn't heard. He was a very nice man as I recall--our irish dance class from McConnell's used to dance on his show from time to time. I remember some of the technical "glitches" that made this show so much fun to watch. One time the string that controlled Archie Wood's lipps broke, and "Uncle Bob" had him say "Now I'm a ventriloquist too". How did Bob pass away?